I often go through phases of checking the fridge at the end of the day looking for chocolate. I go through these craving days (or more accurately - weeks!) frequently enough that we usually have a block of fair trade dark chocolate sitting there so that I can have a few pieces to satisfy my craving. Since I recently used all of our fair trade chocolate up making delicious chocolate peanut butter brownies this has not been the case.. I then forgot to get more at the shops. I was starting to get desperate and then it hit me. I could make raw chocolate! It is so quick and easy to make I don't know why I forget to do it at times. It takes no longer than 10-15 minutes to get them into the fridge and then around half an hour for them to set. 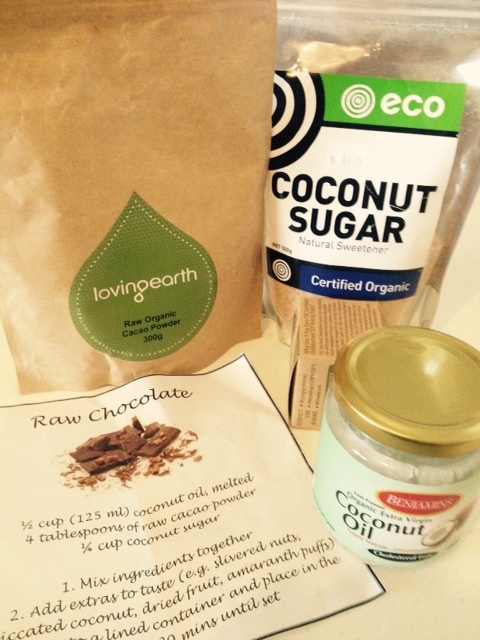 Raw chocolate has high levels of antioxidants and magnesium from the superfood cacao powder. If you are wondering, yes cocoa is different from cacao. Cacao also has high amounts of calcium and iron, which are both important for good health. 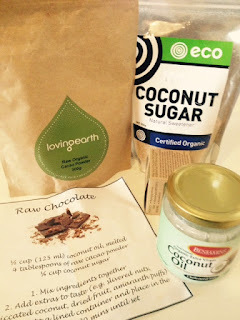 Since the cacao is not roasted or cooked all of these important ingredients are available for your body to use. Are you getting the picture? Raw chocolate is a guilt-free food that will help to supply you with important nutrients and make you feel good by giving you your chocolate hit! Plus your choice of extras to taste: e.g. slivered nuts, desiccated coconut, dried fruit, amaranth puffs. 2. Add your choice of extra ingredients to taste. 3. Pour into mini baking cups (small cupcake liners) and place in the fridge for 30 minutes until set**. *Note: Coconut oil is liquid at room temperature in summer but at cooler temperatures solidifies. To melt place required amount in a bowl and sit it over a pot with warming water. Do not let the bowl touch the water. It will quickly melt. Take of heat as soon as it has melted and mix in the rest of the ingredients. **Note: Remember these will melt out of the fridge if the weather is warm. My bestie is trying to cut dairy out of her diet at the moment too so I shared this recipe with her at the same time I wrote this post. She was struggling to cut out chocolate, as I'm sure many of us would. She loves the raw chocolate and is set to start making some herself. For our latest batches, at Mr Fix It's suggestion, I added dried goji berries and crushed almonds. When I made it with my bestie we also added some puffed amaranth for texture. They were all delicious. The goji berries gave a delicious chewy texture and the almonds are always a favourite of mine for their crunch. Spice it up and mix it up however you like - enjoy!